The welcome return of our numerous summer visitors. Some of our favourite summer visitors are back, and, having arrived a couple of weeks ago they waste little time getting to work breeding and building nests, and if you keep an eye out you should have little problem finding nest sites for at least one of the listed species, around which there will doubtless be plenty of activity. Swallows in particular are very tolerant of people and it is a great opportunity to watch the adults feeding and nurturing their young. We would of course be remiss if we didn’t clearly state that great care should be taken not to disturb them – if at any point you suspect that your presence is preventing the adults coming in to feed the young then leave the area immediately. With care though, very good views of nest sites can be enjoyed without any disturbance. Swallows, Swifts, House and Sand Martins are all summer visitors migrating to and from southern Africa in a similar pattern to Osprey as covered last month. All bird migration is an amazing undertaking but a 5,000 mile journey (each way) for a bird as diminutive as the sand martin with a length only 12-13cm seems emphasise this feat even more! Having said that, all of these species spend much of their lives on the wing, with the Swift being the most extreme example, which will doubtless stand them if very good stead for the long migration. Sand Martins are often the first back to our shores, and are usually present from March to October, Swallows and House Martins are with us from April to October and Swifts usually the shortest period, from May through to August before returning South. This is, of course, dependent on food. All these species live of insects, usually taken on the wing; these are much more plentiful during these summer residency times. However, this is all beginning to change. As our global climate is changing the natural world is reacting. Migration patterns and indeed, where species are found is all altering in response to a warming climate. In this case, this may mean that the birds do not migrate as far South or it may even result in them not migrating at all! There are increasing reports of many of our summer migrants staying and surviving winter in the UK, and in British Trust for Ornithology (BTO) confirmed this year that a swallow had successfully survived our winter have over wintered in Truro. Realistically this is very likely to be a sign of things to come, and as a side note, the more people recording this kind of data the clearer the picture that will be formed. Experts can collect this data and use it to detect and predict emerging patterns. The study of seasonal changes in animals and plants is termed phenology and if you are interested in getting involved in recording for ‘your patch’ then you can do so either via the British Naturalist Association or via the UK Phenology website. Currently these facilities are rather underused and the more its use can be encouraged the better! Having looked a brief overview of the species and their migratory habits we will now look at each species in a little more detail. Sand Martins are our smallest European Hirundine (a collective name for martins and swallows but not including swifts) with a length of merely 12-13 cm. Their wings and upper parts are a dark brown/grey colour with their underparts being white. They have a clear dark brown/grey band separating their white throat and white belly. They are very agile fliers and feed mainly over water and will perch on over head wires and trees. Their diet consists of insects taken on the wing. Sand Martins nest in colonies which may be quite large (>100 pairs) and, as their name suggests prefer vertical sand banks which may be found in gravel pits, riverbanks and sea cliffs. They may also adapt to opportunities provided by gaps in brickwork. Their nest creation involves a surprising amount of work, creating horizontal tunnels that can be up to 1m deep – it is no surprise that nest sites are reused when possible! The actual nests are constructed using grass, feathers and leaves and between three and seven eggs are laid in late May or early June. The two week incubation period is shared between the males and females and all eggs hatch at the same time. The young are then fed by both parents and fledge after 19 to 24 days. They are then given a period of around one week before they are deemed independent. At this point the parents begin the process again, generally raising two broods per year. Generally Sand Martins leave our shores, heading back to Africa by September. House Martins are a little larger than Sand Martins at around 13-15 cm. Their distinguishing feature is the white rump which contrasts sharply with their otherwise black upper parts. Their underparts are all white and they also have a short forked tail. They spend much of their time in the air hunting insects at various heights, frequently very high in the air. They often perch on telephone wires, especially when newly fledged. 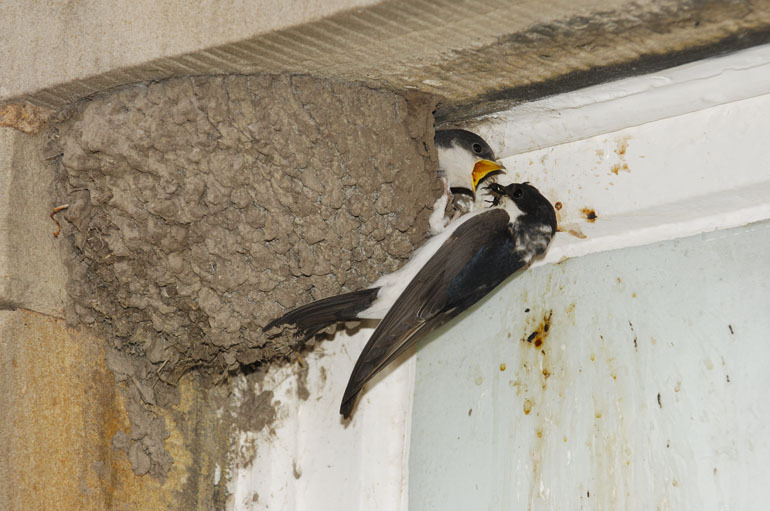 House Martins usually nest in small colonies of around half a dozen nests, though much larger colonies are also possible. True to their name they very often nest under the eaves of buildings and less frequently in roofs or sheds. The nest is made of a mix of dried mud, grass and feathers. A nest takes in the region of 10 days to build and consists of over 1000 beak sized pellets of mud! Breeding runs from May through to August, and usually incorporates two broods. Clutch sizes are usually 4-5 eggs and are laid at daily intervals. Incubation is carried out by both parents and last for 13-19 days, at which point the chicks hatch together. They are then kept warm by the female for a further week as they are without feathers and cannot maintain their own body heat. The chicks are ready to fledge after 22-23 days but have a grace period of several days during which time they return to the nest to roost and are still fed. They may then stay with the colony for a further few weeks before joining pre migratory colonies. These colonies begin the journey back to Africa in October. Swifts are the kings of the air. Whilst all of the species listed here spend much of their time in the air, the swift really do take the title. Swifts feed, mate, collect nest material, drink and sleep on the wing, they never perch, they land only to nest. In fact, they are so well adapted to the air that if they do becoming grounded can lead to their deaths as they often cannot become airborne again without assistance – the RSPB information on ‘What to do with a grounded swift’. LINK Swifts feed on flying insects and airborne spiders, and drink by either catching raindrops in midair or by sweeping low over water and skimming from the surface. Swifts are 17-19 cm, but have larger wingspan (42-48 cm) than Swallows (32-35 cm) giving the appearance of a larger bird. They are dark coloured on both upper and under parts except for a pale area on the throat. Swifts pair for life though pairs do not necessarily stay together outside of the breeding season. Their nest is usually under eaves and in high building where the adults are able to ‘drop’ out of the nest and into the air. As swifts barely ever land, the nest is built of materials collected on the wing such as feathers, straw and other plant material. It is cemented together with saliva. Nests are built by both adults and are reused year on year after any necessary repairs have been carried out. Nest sites are usually colonial but at least 1m apart. Eggs are laid with an interval of 2-3 days; usually 2-3 are laid in total and due to a lengthy fledging time only 1 brood is raised per year. Incubation lasts from 19-25 days, to ensure that all eggs are incubated for around 20 days. This duty is shared by the adults who for reasons unknown eject fertile and non fertile eggs more commonly than expected. Surprisingly, if the year is particularly poor and adults have to spend long periods away from the nest hunting for food, the development of the embryos slows down until a parent returns. For most other species this would kill the embryo, incubation can be extended by up to 5 days during bad years. In line with the eggs being laid a few days apart, the young also hatch a few days apart. This means that in years where food is plentiful the smallest will quickly catch up, in poorer years the larger one has more chance of survival as it will dominate. The fledging period is very long in swifts, and in a good year is about 6 weeks. Furthermore, in a similar system to above, in bad years the young can reduce their metabolic rate and survive for several days using fat reserves. This can delay fledging by up to 2 weeks! However, once fledged they are immediately independent. If the young do leave the nest too early and crash land, they are extremely unlikely to survive without intervention. Once in the air their live almost permanently on the wing has begun. Whilst being one of the latest to arrive, swifts are also the earliest to leave and begin their migration South in August. Traditionally the return of the swallows has always been associated with the coming of Spring. They are larger than the Martin species at 17-19 cm, partly due to long streaming tail feathers and more colourful. Their upper parts are a glossy blue/black with a white under sided body and buff wings. Perhaps their two most distinct features are their long tail streamers and their red forehead and chin. On the underside, there is also a dark banding between the red chin and the white belly. They are also famous for their incessant trilling as groups fly overhead. 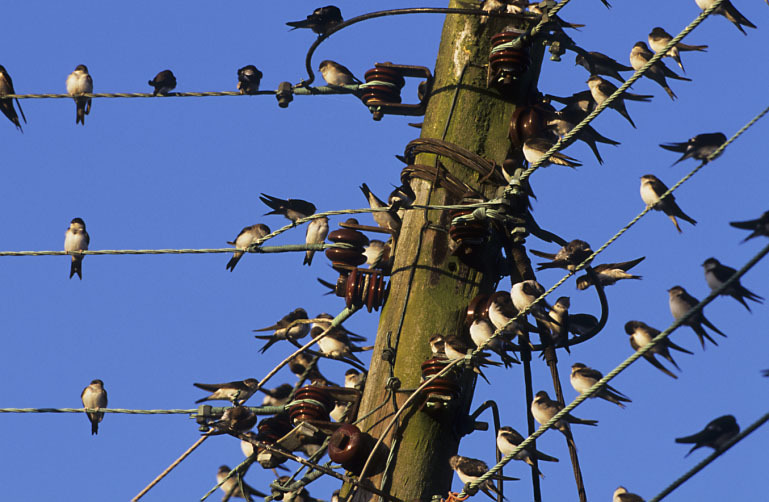 Swallows regularly perch on overhead wires and less frequently on the ground. They feed mainly on insects, hunting over low ground. 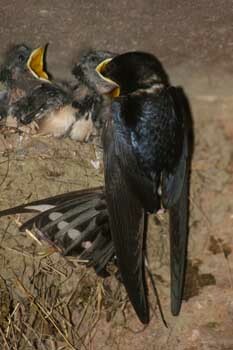 Swallows are generally communal but nests are usually separate, though may not necessarily be far apart. Their nest is usually in an outbuilding, under a bridge and any suitable dark ledge which will support the nest. This is an open cup nest made primarily of mud and reinforced with plant material. Eggs are laid one per day with 4 or 5 eggs being laid, usually beginning in May, and there are frequently two broods. Incubation is around 17-19 days and is carried out primarily by the female with only occasional efforts by the male. The hatched young fledge after about 20-22 days. Whilst raising the young both parents feed the young but if food becomes scare the male will look more towards its own needs than that of the young. The female will care for herself and the young evenly. Swallows generally begin their migration back to Africa in October, though as noted above this seems to be getting increasingly late. Having briefly looked at the life styles of these summer migrants I hope that you are able to find a site near you to see their aerial acrobatics and listen to the trilling swallows or the screaming swifts as they are out in force finding food for their young.